Waterford, the town settled by a people seeking peace, became an armed camp during the winter of 1862. Eight months of war had changed a once prosperous community into one of want. "Its citizens were destitute of coffee, sugar, salt and many of the articles necessary for daily living." The Army of the Potomac lay in its winter camps around Washington and along the upper stretches of the Potomac River as far as Harpers Ferry. The Confederates had encamped around Manassas Junction with a brigade under D. H. Hill at Leesburg. The Waterford garrison, under Hill's command, consisted of the Madison (Va.) cavalry and a company under E. V. White, a Loudoun man. These two companies were busily engaged in scouting toward the Potomac in an attempt to prevent Union sympathizers from crossing into Maryland and to watch the Federal forces along the north bank of the river. General McClellan's army began to I move down the Potomac in an "On to Richmond" offensive. General Joseph E. Johnson withdrew his Confederate army from around Manassas to meet this new threat on Richmond. All along the lines preparations were made for the coming spring campaign. On February 24, Colonel Geary crossed his Union regiment at Harpers Ferry and occupied Lovettsville. Guiding Geary's columns was Means, the man with a price on his head. 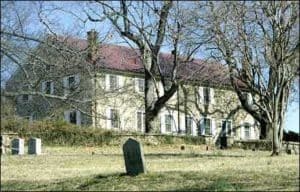 The occupation of northern Loudoun increased the pressure on the Waterford garrison, but the Loudoun county outpost could no longer be held. General Hill moved his brigade from Leesburg to follow the withdrawing Southern army but left the cavalry companies at Waterford to watch and delay Geary's advance. (4) In retiring, Hill burned a large area across the southern part of the country. Mills, barns, stock yards, and bridges were destroyed to impede the progress of the enemy and deny him food and forage. The Waterford community had expressed itself strongly against secession at the referendum held the previous May and the Confederates were inclined to think of the village as hostile territory. There is little evidence of acts of violence between soldier and civilian; however, a feeling of mistrust prevailed. "Just before the rebels evacuated the village of Waterford near Leesburg, Virginia, they openly avowed they would burn it to the ground, as it was nothing more than a 'cursed Quaker settlement.' A noble-hearted Quaker woman, whose husband had been chased from his home by the rebels some months before, besought a gentleman of her faith to hasten over to Colonel Geary's camp, some eight miles away, and ask him to send a force to Waterford to prevent the threatened conflagration. He had a fine horse, but declined the duty, owing to the dangers of getting through the rebel pickets. "Lend me thy horse, then,' she said. He declined again. 'Then I will steal thy horse," she said, 'and go myself." She forthwith directed a servant to take the horse to a neighboring wood, to which the owner made no resistance. Thus this pretty little village was saved from conflagration by the resolute conduct of this Quaker lady." Waterford once more settled down to peaceful pursuits. Farmers would soon be planting their spring crops, but the shortage of horses impressed for war service would curtail their work. "In the spring of 1882, the Federal troops came in and the Confederates withdrew to the more southern part of the state. It was then supposed by the Union party, that the Southern droops would appear no more among us, but in this they were greatly mistaken. There was, however, a perceptible change in the conduct and conversation of the secessionists. They became less defiant, less confident, and more courteous toward us. Some of the Union men felt disposed to retaliate for past injuries by annoying he secessionists, but in general, they were moderate and willing to assist their neighbors of that party when their property was seized by the Federal soldiers. This disposition to alleviate the horrors of war, by acts of kindness and mercy, was indeed manifested by some of both parties, and became more prevalent as the alternate successes end defeats experienced by both taught them the uncertainty of military operations and the benefit of mutual forbearance." In January, 1862. Secretary of War Edwin M. Staunton had summonsed Samuel Means to Washington. There, Stanton offered him a commission as captain with authority to raise a company of cavalry to be known as the Independent Loudoun Guards. A curious feature of this commission was that the company was to be recruited for special service and subject only to Stanton's instructions. Because Means jealously guarded his right to operate independently, the order was a constant source of irritation to field commanders. Means' resignation finally was prompted by an order of General Sigel, then in command of the Department of West Virginia, who attempted to consolidate Means' command with the Third West Virginia Cavalry. This Means refused to do and he was sustained by the Secretary of War. But so much bitterness had been created that he left the service on April 13, 1864. The records fail to record a similar commission during the war, and we may speculate that this was a special inducement granted to one from a seceded state. Captain Means was mustered into the United States service by Colonel Dixon S. Miles at Harpers Ferry, June 20, 1862. At the time of mustering the name of Rangers was substituted for Guards; thus, the only organized body of troops from Virginia to fight or the Union would be known as the Independent Loudoun Virginia Rangers. Headquarters immediately were established at Waterford where recruiting was begun. Twenty-eight men were quickly enrolled. Soon after the first of July, the company moved to Lovettsville and camped in the German Reformed Church, where twenty-five more recruits joined the Rangers. The company now numbered more than fifty men and was entitled to elect its officers. The election completed the organization and made it ready for operations. Secretary Stanton had instructed Means to mount his company on horses that belonged to persons who had joined the Confederates. This further enraged those who already had termed Means a "renegade." A stranger staying near Waterford was arrested as a suspicious character and taken to Harpers Ferry where he was questioned at great length. His answers must have been satisfactory for he was allowed to take the oath of allegiance, after which he joined he Loudoun Rangers as drill sergeant. This man gave his name as Charles A. Webster but was quite reticent About his past history. He had seen Prior military service and was quite adept at drilling raw recruits. To him principally must go the credit for bringing some semb1ance of order to his group of civilian boys suddenly turned soldier. While he lived, myths grew about him, as they do about all mysterious characters. His death made it impossible to piece together with any accuracy the threads of his life. He was a man without fear, as his courage on several occasions testified, but his personal character left much to be desired. His name was believed to be Brown, but the name of Webster was taken from his mother's family, a relative of the illustrious Daniel. He was well known to the men of the Tenth Maine Regiment, and it is quite possible that he had served with their organization at one time. It would also appear that a favorite pastime was wooing and marrying young ladies. He left the company in the fall and was captured by the Confederates in December, 1862. His bravery and daring caused the Confederates many anxious moments even after his capture. They were so afraid he would escape that he was bound and gagged until he could be delivered to Castle Thunder in Richmond. He tried to escape by jumping from a third story window after dark, breaking both legs. (11) He was hanged on April 10, 1863, being carried to the scaffold in a chair. There, he insisted on giving the signal for the trap to fall, and did so by tossing his hat into the crowd of witnesses. (12) He would have been of inestimable value to the Rangers during their three years of active service, had not his wandering nature prevented him from staying with one organization for any length of time. Using Waterford as a base, the Rangers were engaged in scouting throughout July and early August, but as the Confederates had moved south there were few encounters with the enemy. Despite the efforts of Drill Sergeant Webster a high degree of efficiency and discipline had not been reached. Means was not a military man, and the order under which he operated was not conducive to a well organized and disciplined company. Elijah V. White, a prosperous farmer from the east side of the Catoctin Mountains, distinguished himself in a civilian capacity during the Battle of Ball's Bluff In October, 1861. As a result, he was commissioned Captain in the Confederate forces, with permission to organize a company of cavalry. This company was the forerunner of the Thirty-fifth Battalion Virginia Cavalry that gained much fame under Colonel White throughout the war. It was Captain White's company that had occupied Waterford in January, 1862, and there remained in scouting and patrolling until March, when it joined the main Confederate army as the Union army began its spring campaign. Through Confederate sympathizers, White heard of the encampment at Waterford of those Virginians who had enlisted in the hated "Yankee Cause" and decided to "Whip Means." On August 25th, White left the Confederate army and marched north with about sixty men to fight the Loudoun Rangers, then encamped in the Waterford Baptist Church. Following the mountain road from Leesburg, White halted his party about a mile east of the town and sent scouts to determine if the enemy were still there. The defeat, so soon after organization, had a serious effect on recruitment. Hopes of regimental or even battalion strength vanished. Means had to expect to build the organization with Virginia men because those from nearby Maryland were joining their own organizations. Many young men who possibly would have joined the Loudoun Rangers failed to enlist after the setback. The organization would continue until the end of the war, but its strength never would exceed one hundred and twenty men, divided into two companies. The early days of September saw General Lee bring his Army of Northern Virginia through Loudoun County for the Maryland campaign. While this army stayed east of the Catoctin Mountains, it severed communications between the Waterford community and Maryland. Again the citizens lost contact with the Union they were supporting, and from whence came most of their meager supplies. Sound of the desperate battle along the banks of Antietam Creek had been heard by all the citizens of Waterford. (25) but the war had passed them by since the battle at the church. The Army of the Potomac had been idle for more than a month after Antietam, but finally during the last days of October, McClellan moved this army toward Berlin (Brunswick) and Harpers Ferry to cross into Loudoun County. The Ninth Army Corps crossed at Berlin on October 26, to encamp in the vicinity of Lovettsville until the 29th. 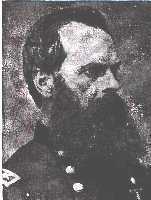 General Orlando B. Wlllcox's first division of that corps, with the Loudoun Rangers as guides, moved to Waterford on the 29th. (26) Although the ranks were depleted by their attempts to force a crossing at Burnside's Bridge late in the battle, this was the largest body of troops to move through the town since the beginning of the war. For two days Willcox rested his division along the banks of Catoctin Creek before moving on south to rejoin the Army of the Potomac. A blockade had been established along the border, and only Union sympathizers were allowed to carry goods south of the river. Lieutenant Luther Slater still not fully recovered from the wounds received at Waterford, rejoined the company in late November. Being unfit for field service, Slater was appointed Provost Marshal of Point of Rocks. (27) That was good news for the Union people of Waterford because Slater's extensive acquaintance enabled him to decide who could take goods through the blockade. White's command, now a battalion, returned to Loudoun County in early December after serving with the Army of Northern Virginia. He returned to Waterford, still searching for Means, but the Rangers were not in the town this time. "After frightening the intensely loyal citizens of Waterford half out of their wits" the battalion marched to Beans' Mill and encamped for the night. (28) The next day White returned — this time to encounter one squad of the Rangers. Being greatly outnumbered, the squad dropped back toward Lovettsville, after losing two prisoners and capturing one. The main armies now had gone into winter quarters along the Rappahannock River. There was little activity along the border. A shortage of supplies and occasional Union patrols from Harpers Ferry and Point of Rocks were the only reminders that there was still strife across the land. (25) This statement has been handed down through many families then living here, but it was not known at the time where the battle was being fought.